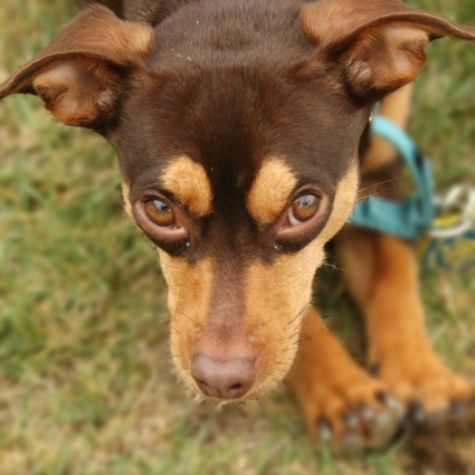 We found Robert Henri (Ro-bare On-ree), a Mini Pin/Chihuahua mix, at a local rescue. Now he�s the love of our lives, along with Claudia (Chihuahua), Bastet, Orange, and Piyaa (cats). Wherever we go, so many people comment that Robert�s friendliness �made their day� that we decided to share his warm and fun personality. Robert has no formal training, but we give him lots of positive reinforcement. His extra curricular activities include modeling, dog shows, and spending time at the stables.